They came, they danced… and they raised an incredible £25,000 for Poppyscotland. 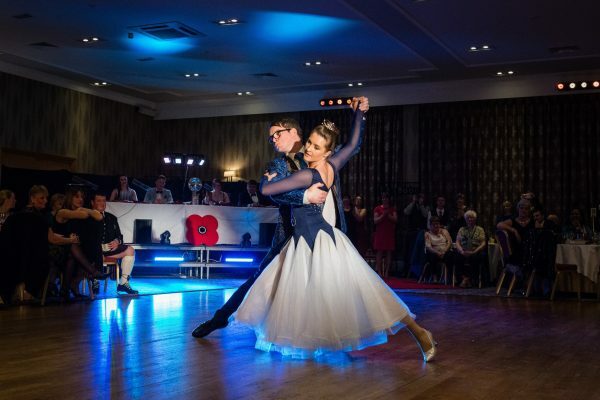 The leading Armed Forces charity hosted its second annual ‘Come Dancing with Poppyscotland’ event in association with Toe 2 Toe Dance, at the Macdonald Drumossie Hotel, and those taking part, along with a host of other supporters and sponsors, helped smash last year’s total by £4,000. A sell-out crowd of more than 300 gathered at the hotel to watch the duo of Audrey Anderson and Toe 2 Toe dancer Paul Robertson lift the coveted ‘Glitter Ball’ top prize. The winner of the ‘Top Fundraiser trophy’ was Liz Sutherland, who raised more than £2,500. The format of the event is similar to the popular BBC television series in that dancing pairs are made up of one beginner/amateur together with an experienced dancer from Toe 2 Toe Dance. “Fundraising for Poppyscotland has been an eye-opener into the wonderful things they do for veterans and their families and I wish to continue to help doing charity work. “We thought the first Come Dancing with Poppyscotland event was special, but this year’s really captured the imagination. Tickets sold out before Christmas and we had a crowd of more than 330 people cheering on our dancers. The good news for dance fans throughout the north-east of Scotland is that Come Dancing with Poppyscotland will return in 2020, and will again be held at the Macdonald Drumossie Hotel on Saturday, 29 February. If you are interested in applying to take part, or are a business who would like to sponsor part of the event, please contact Frances Beveridge, Poppyscotland North of Scotland Regional Fundraiser, on 01463 701 764, or at f.beveridge@poppyscotland.org.uk. For further information and all media enquiries, please contact David A. Findlay, PR Manager at Poppyscotland, on 079797 35611, or email at d.findlay@poppyscotland.org.uk. Poppyscotland provides life-changing support to the Armed Forces community. Money raised from the Scottish Poppy Appeal and Poppyscotland’s year-round fundraising enables them to deliver support to members of the Armed Forces community in Scotland by providing tailored funding and assistance. The charity also funds services in advice, employment, housing, mental health, mobility and respite. Please note that we are known as “Poppyscotland”, and not “PoppyScotland” or “Poppy Scotland”. For more information, please visit us at: www.poppyscotland.org.uk. The Macdonald Drumossie Hotel is one of the leading conference and function venues in the Highlands and combines heritage, luxury and convenience all in one outstanding venue. It is situated in nine acres of stunning parkland – only ten minutes from the city centre and a few minutes from the A9 – and lies within easy close reach of several of the finest links golf courses in the world. In addition, the hotel is perfectly positioned for the rich, local heritage of Culloden, Loch Ness and the Cairngorms, making it perfect for a relaxing break or a romantic getaway. For further information, please contact Brett Jackson or Lesley Eaton, Granite PR, at brettjackson@granitepr.co.uk, or lesleyeaton@granitepr.co.uk, or call 07808 727 167 or 07595 200 662.